Depending on your point of view the idea of digital disruption can have a polarising effect. It’s a new future of innovation, progress and exciting opportunity. Or the unemotional march of technology, up-ending established ways of doing things and obliterating comfort zones. The latter is felt keenly by businesses built on bricks and mortar. E-commerce — and one ubiquitous online retailer in particular — has certainly had a major impact on the retail sector, offering consumers greater choice and convenience at lower cost. While shopkeepers pay rent and bills, we can browse their goods before scanning the barcode to see if we can get it cheaper online. But the market is the market and those who fail to adapt won’t make it. And so it comes as a surprise when an established business catering for the immediate practicalities of everyday life — shoe repair and key cutting in this instance — not only embraces digital disruption but does so in a way that bucks those trends and challenges the assumed arc of progress. Timpson — a UK-wide shoe repair chain — has opened a shop offering digital identity and personal data services. Yes, a real shop in a real building in a real High Street. ArkHive is billed as the world’s first identity shop, providing ID verification, DBS criminal record checks, pre-employment screening and assistance in applying for official documents. The idea was born out of a convergence of interests within the Timpson Group, along with a dash of altruism. The Group already offered ID photos through some of its branches as well as the Snappy Snaps and Max Spielmann photographic processing chains it owns, and so it already had on its radar the UK Government’s Verify programme, a beta project that checks the identity of people accessing online Government services. The problem, Will explains, is that not everyone would find it easy to come along for the ride. The Timpson Group joined the Open Identity Exchange — whose Executive Director Don Thibeau gave an interview to Internet of Me in January — which has worked with the Cabinet Office on Verify. They also brought in the Innovate Identity consultancy to get the ArkHive idea of the ground. Innovate Director Rob Laurence takes up the story: “There is a danger that a section of society which is not digitally enabled gets completely left behind. So I think the first intention here was to bring digital to the High Street but also to help and give people confidence to give going online for themselves a try. With more and more Government services going online, the question is how do you support these people that can’t do it themselves? The Timpson Group then started talking to private sector organisations — banks, fintechs and other online businesses — about issues such as verifying people’s identities for activities such as e-commerce and pre-employment screening. 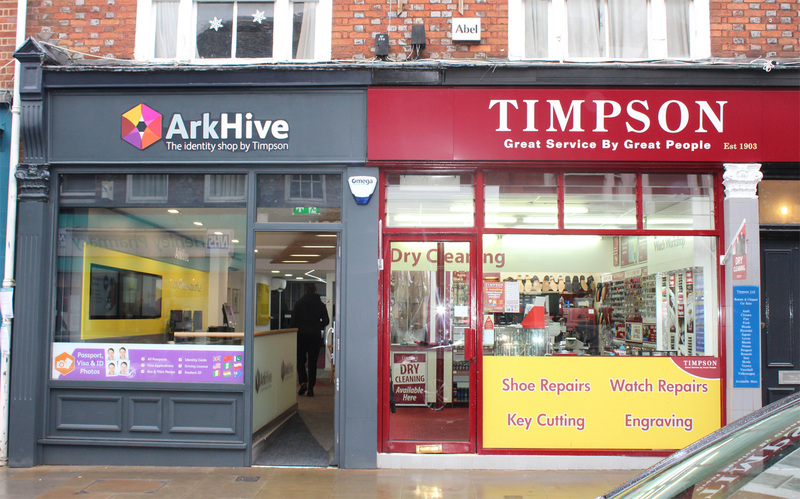 In November last year the first ArkHive shop opened in Henley-on-Thames, next door to a branch of Timpson. The ID services on offer at ArkHive — including Personal Data Stores in which to keep verified documents — are built on the Mydex trust framework and platform. If there is enough interest, the plan is to open more shops or offer ArkHive facilities within the Group’s other stores. The level of interest, of course, is the big unknown. But the business strategy is as radical as the idea itself. The philosophy here isn’t to seize every opportunity to monetize, monetize, monetize. In fact, while this is a business and making money is certainly part of the plan, it is not an immediate priority. And the focus for revenue will be on businesses using the ArkHive services rather than the customers walking into the shop. This is an experiment, and the attitude seems more like that of a tech start-up than an established company looking to diversify its offering. There is no doubting that opening up online services to people who might otherwise be marginalised is important. Schemes like Verify are pioneering new ways to deliver efficient public sector services with the potential for huge cost savings, but those services have to be accessible to everyone. The personal data economy is set to grow exponentially, with a shift in ownership and control over information back to the individual something that is absolutely crucial to its success. So while a true Internet of Me will bring profound changes to the way we live our lives, it must be inclusive and not create a digital underclass.